It was an honor to be involved with the addition of new science lessons to the Big History Project (BHP) course curriculum. A little more than a year ago, I was looking for collaborators here at the University of California, Berkeley, where I work as a public education specialist at the Space Sciences Laboratory. I had the inklings of an idea: build a curriculum that combines elements from history, civic engagement, and other social science disciplines with elements from cutting-edge science in order to instill in students something I call planet pride. The grand scheme was to deemphasize nationalism and instead encourage a better appreciation for our planet and species, which would eventually lead to a greater desire for peaceful coexistence and cooperation among ourselves and with nature. Some of this thinking came from my astronomy colleagues’ ever-growing number of discoveries of new planets where life might exist, and perhaps even be “intelligent,” like us. That’s what my friends with the Berkeley SETI Research Center are really hoping to find and, by the way, for which they just got a huge influx of money to increase their chances. 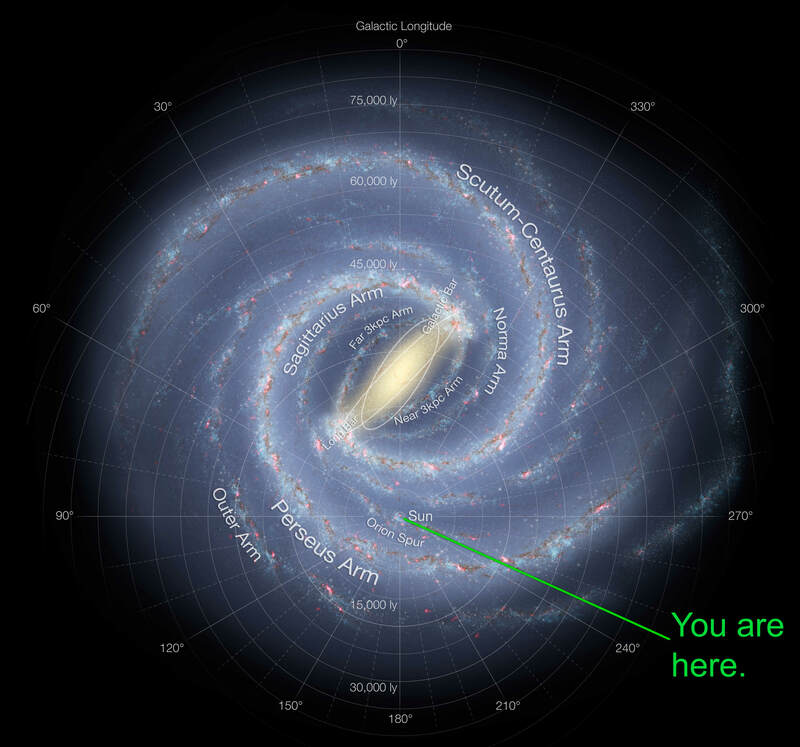 Artist’s conception of the structure of the Milky Way, including the location of the spiral stellar arms. By NASA/JPL-Caltech/ESO/R. Hurt – Public Domain. What happens when we make contact? I don’t see it happening quite yet, but maybe one day we can get more young people thinking about what they would most want to boast about when describing Earth to intelligent creatures from other planets: Our biodiversity? Culture? Our oceans? Art? Perhaps more important, what do we need to spruce up before anyone visits? One thing led to another, and before I knew it, I was meeting with people from BHP and talking about how history and science are so intertwined, yet still pretty much remain in their silos in the K-12 world. As a growing new discipline and by its very definition, Big History must break this practice. Attracting more science teachers to the course is a vital component to BHP’s successful evolution. But should there really be any resistance? Those of us in the Big History camp already know that both history and science rely heavily on the constant search for new evidence to correctly tell a particular story. Much of science is in fact history as recorded and told by nature. Both disciplines want to know how and why things happened so that we better understand the world around us today, and make smarter decisions for our future. And of course, science and technological advances and revelations have shaped human history and feature prominently in today’s history courses. Figure 1 The 13.7 billion year lifetime of the universe mapped onto a single year. By Efbrazil, CC BY-SA 3.0. I don’t by any means advocate dismissing standard history curricula. 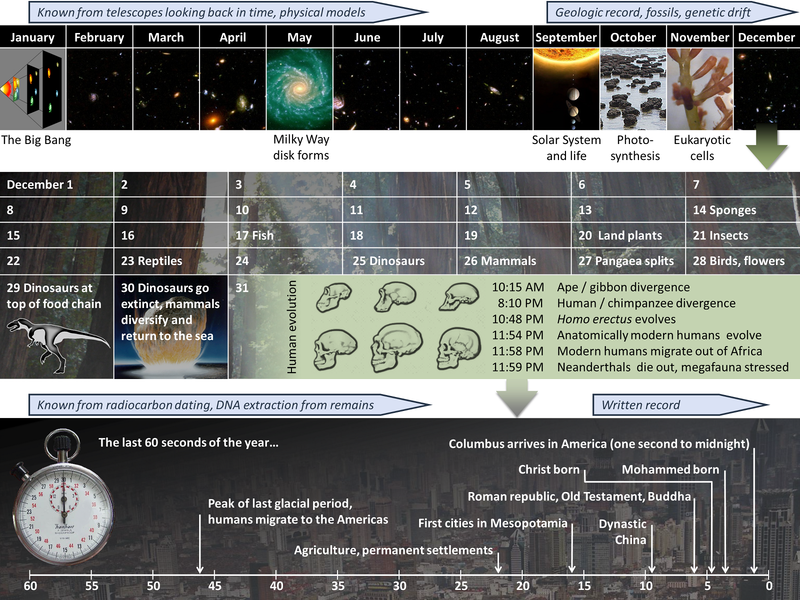 Though human history accounts for less than a day on the cosmic calendar, it’s tremendously important we fully understand our many successes and failures in significant detail. But I really wished Big History had been offered when I was a youth. I think I would have developed more quickly some sympathy for our fledgling species, despite all its many skirmishes since the first sticks and stones were raised. And I would have had even more amazement for our rapid technological advances and our ability to cope with ever-increasing challenges. Better still though, I think I would have acquired a more urgent appreciation of our species’ relatively rare and miniscule home, and would have understood sooner that just about everything we do collectively here on Earth has an impact on and plays a role in our forever shared future with this (so far) one-of-a-kind life-giving planet.